The business of customization is not limited just to automobiles. In fact, if you have the cash to splash, pretty much anything goes. iPhones encrusted with diamonds are not unheard of, as are gold-plated laptops and computer casings. It is a niche but lucrative market and Gigabyte is making its entrance here with its latest mouse - the Elegant Vogue wireless mouse. The Gigabyte Elegant Vogue wireless mouse is no ordinary mouse with gaudy LED lights trying to establish "l337" cred. Instead, it is touted as an elegant solution and as such, is fittingly adorned with Crystallized Swarovski Elements crystals. These crystals are complemented by 18k gold-plated finishing and buttons. And finally, the Elegant Vogue receives its toppings in the form of a leather surface with two-tone stitching, not unlike the kind that you'll find on luxury cars. As a whole, the Elegant Vogue certainly exudes an air of luxury, but as the saying goes, "Beauty lies in the eyes of the beholder." To some, the Gigabyte Elegant Vogue may be the most beautiful mouse they have ever laid eyes on, but to others, it can come across as vulgar and decadent. We think that Gigabyte got it just about right with the Elegant Vogue. It looks opulent but not overly so. Given its looks and small size, we think that it'll be a hit with the ladies. Underneath the pretty Swarovski crystals, shiny gold-plated buttons and leather suit, is in fact a Gigabyte GM-M7800 wireless mouse. You heard us right, the Elegant Vogue is in fact a pimped up Gigabyte GM-M7800. But that's not necessarily a bad thing because the GM-M7800 is a very competent wireless mouse. It has everything that you'd come to expect from a decent wireless mouse. 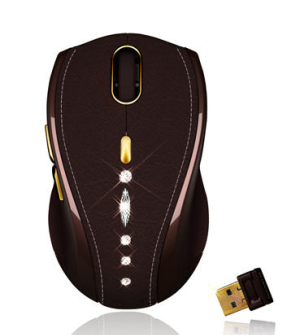 First of all, it uses a 2.4GHz wireless connection via a handy transceiver which can be stowed neatly in the underside of the mouse, making it an ideal travel mouse. You can also switch between 800 and 1600DPI on the fly. Two buttons on the sides are mapped to the "Front" and "Back" functions on browsers, making web browsing a more enjoyable experience. The Gigabyte Elegant Vogues requires two AA-sized batteries to operate and we thought that a Lithium-ion battery pack would have been more fitting for a mouse like the Elegant Vogue. Happily, however, Gigabyte has provided two batteries and the mouse was still up and running after more than a week's use. The Gigabyte Elegant Vogue is a bold move by the Taiwanese manufacturer and it is a commendable attempt. Its extravagant looks could divide opinions, but there can be no argument about its performance because it delivers the goods. That said, taking in account its small size, we feel that the Elegant Vogue was designed with ladies in mind. To preserve its exclusivity, the Elegant Vogue is limited to only 10,000 units worldwide, so if you are interested, there's no time to lose.